Our products are stocked by the best leading brands worldwide and we also sell directly to our lovely online customers. A few words about how the competition works, and what’s in it for you! Firstly, to put your mind at ease, by submitting work you are in no way transferring copyright to us. When the competition is over the designs still belong to you. For the duration of the competition shop, your work will be available to buy and your supporters can vote for them – they will need to create an account in order to do so (which is very speedy). This is just so we can ensure (in the interest of fairness), that all votes are unique. Designs with higher points will appear near the top of the shop, meaning that more people will get to see them! Excitingly, there’s actually more than one way to win! Each vote = 1 point and each sale = 50 points and when combined this gives you your total ranking. For this part of the competition, the artist ranked first place will get £300, second place £150 and third £50. 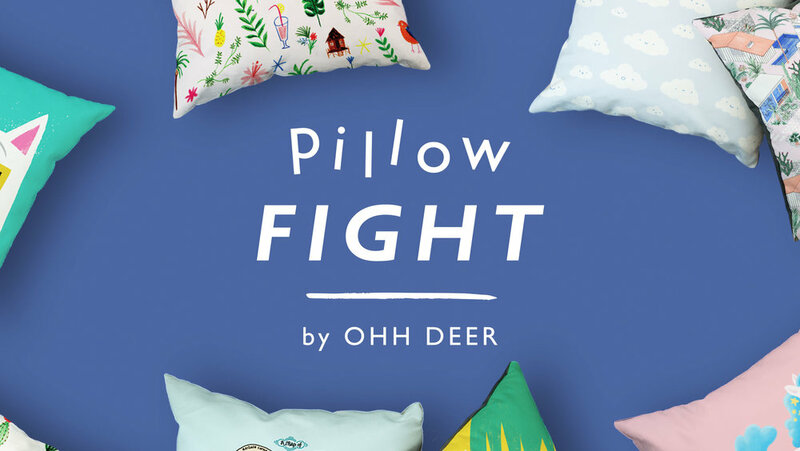 For the part of the competition where we select our next contributor, we at Ohh Deer HQ review every submission, and choose the work we think is the best fit for our creative family! So, even if your ranking is low, you’re still in with a chance to become our next contributor. Equally, those ranked highly will not necessarily also win the chance to become a contributor. SO, YOU MENTIONED GETTING PAID? Yes we did! For each cushion you sell you will receive £1*. We should mention, this is lower than the usual percentage we would normally pay our artists, so we thought we should explain why this is. The dimensions of your file must be 2775px x 2775px at 150dpi. On the supplied template – please delete/turn off the green bleed layer, this is just for your reference to show will be lost when the design is reproduced. Any designs with the green bleed left on will be deleted from our system and not approved. All artwork rights will remain yours. *All commission payments will be sent out after the competition has ended and our 28 day return policy has expired for all competition orders made. This will take approximately 40 days. Payment will be made via PayPal. You will be asked to provide your PayPal email address when submitting work. When you've entered you can check out how everything is going with your entries over at ohhdeer.com/competition - including your ranking and sales! Good luck and get creative!